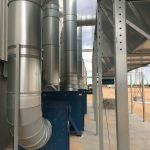 UWE Hay worked with Airtight Solutions at our export facility in Southern New South Wales for the installation of a fully integrated dust extraction system. The staff and leadership at the business were of the highest calibre and the professional approach was felt from the initial phone interaction to the onsite visit, to the cost effective quote of their fully customised solution and installation of the system within our facility. Prior to selecting Airtight Solutions our company discussed our requirements with several company’s however the outcome was there was only one choice. Airtight Solutions provided a highly professional package and after sales service and we would recommend their systems to any other businesses in the agricultural industry with similar requirements. When I upgraded my underperforming cartridge dust collector, Airtight Solutions came highly recommended. My expectations were naturally high, but the system is everything they said it would be and the performance difference is unbelievable! Airtight delivered a quality job and timely with minimal disruptions. The process was made easy and the communication was open and honest. I would recommend Airtight to anyone.